In the last installment, we gave you a brief look at the history of two of our nation’s premiere strike fighters, the Lockheed-Martin F-16 Fighting Falcon and the Boeing F/A-18 Hornet. Now that we’re familiar with the history of the lightweight strike fighter program and how the competing designs both came to fruition, let’s take a look at day-to-day operations. Briefing for a flight in the strike fighter community, regardless of type, is pretty similar regardless of service. The only real difference is how each service approaches certain aspects of briefing items. For example, when briefing “Training Rules” (Rules we use to keep us safe when fighting each other), an Air Force guy might say, “Training Rules are standard in accordance with 11-214 with the following highlights,” and cover weather limitations, when to cease maneuvering, etcetera. Navy dudes will also hit the highlights, but one peculiar difference is that every “Training Rules” brief must include someone reciting the “Boldface Procedures” (checklist items from memory) for what to do if the aircraft departs controlled flight – even if the procedures simply boil down to, “Let go of the controls, the jet will recover itself, but if it doesn’t, move the stick in the direction the command arrows tell you, or eject if you’re not flying again by six thousand feet above the ground.” I’m sure the reason behind this is written in the blood of someone who went out of control and couldn’t remember more complicated procedures, but as an outsider it may seem a bit different. 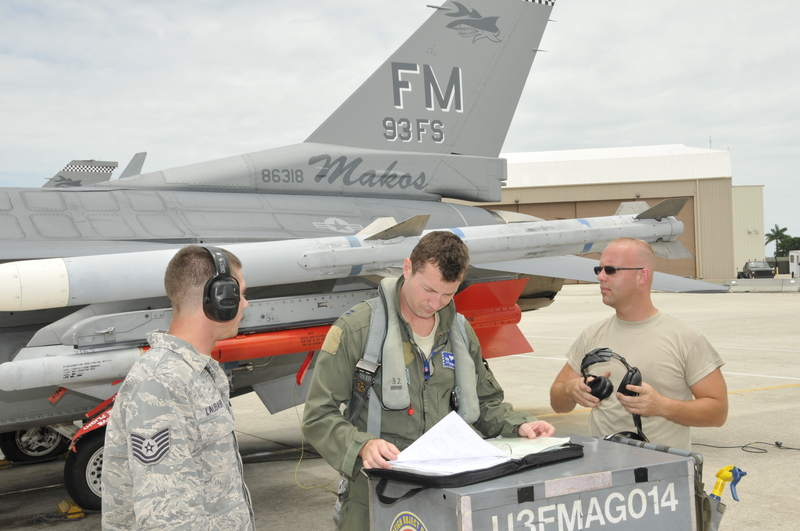 Lieutenant Colonel Jon “Habib” Schultz, F-16C pilot with the 187 FW, Alabama Air National Guard, briefs prior to a BFM sortie. After the brief, we get to walk, or “step” as Air Force pilots would call it. 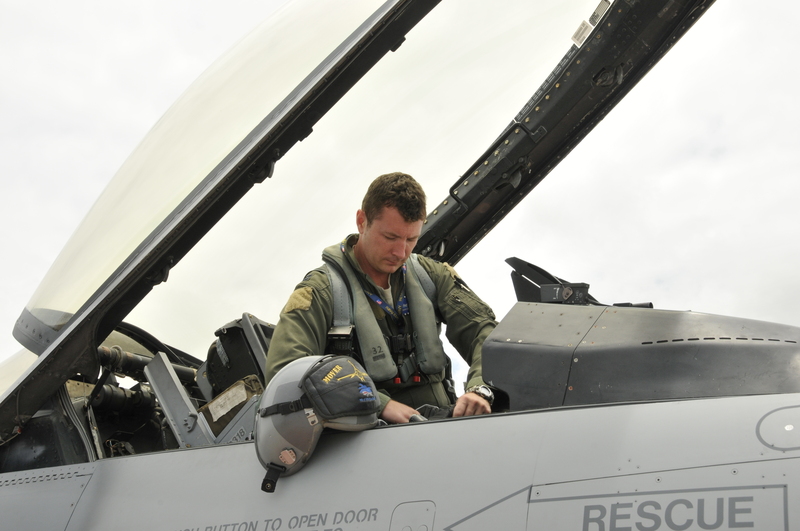 It’s the time between the flight briefing and engine start where a pilot dons his flight gear, signs for the jet and makes the journey out to the flight line. The flight gear required for both aircraft is the first major difference. The F-16 also uses a system called “Combat Edge” to add even more protection against G-forces. The integrated mask and helmet help to provide pressure breathing under G-forces. This feature inflates a bladder in the helmet and forces air into the pilot’s mask to help keep his lungs inflated during high G maneuvering. It also includes an optional vest that most people don’t wear. The system doesn’t exist on the F/A-18, but the aircraft is also only rated to 7.5G versus the Viper’s 9G rating. One of my good friends once got a backseat ride with the Canadian Hornets when I was still flying F-16s, and he made a comment that has stuck with me to this day – suiting up to fly the Hornet feels like you’re getting ready to go deep sea diving. In comparison to the Viper, I think that’s accurate. 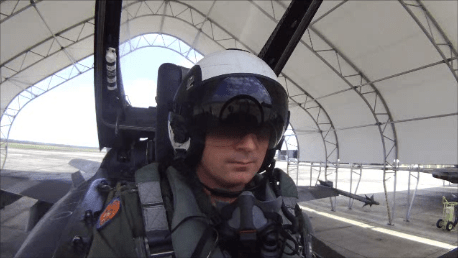 Perhaps more a function of Navy flying than anything else, the F/A-18’s harness and survival equipment are very different and much more cumbersome. Unlike the F-16’s harness, which you can just throw over your shoulders and hook up at the jet, you have to step into the harness of the Hornet. It has no quick release for the leg straps, and pulling it on over the G-suit can result in a twisted mess for someone not accustomed to it. Since the Navy opted out of using a $3 quick release buckle that could be found at any Home Depot, this also affects adjustment. A properly fitted parachute harness should be just tight enough to keep the wearer slightly hunched over so that it’s uncomfortable to walk. The lack of quick release buckles for the Hornet requires the pilot to loosen and tighten the harness going to and from the aircraft, or as I suspect most pilots do, just leaving it loose all the time. I bet the opening shock of a parachute opening would be fun like that though – ouch! 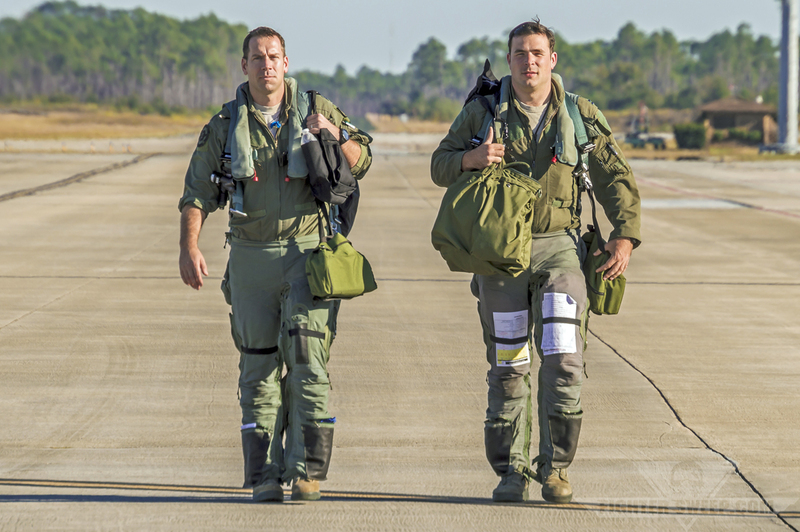 Once the harness is on, Hornet pilots add another twenty pounds of gear in a survival vest that fits over the harness. It includes the survival radio, flares, drinking water, and basic tools necessary to survive during an ejection scenario. There’s also a horse-collar style personal flotation device called an LPU that can be inflated automatically or manually. 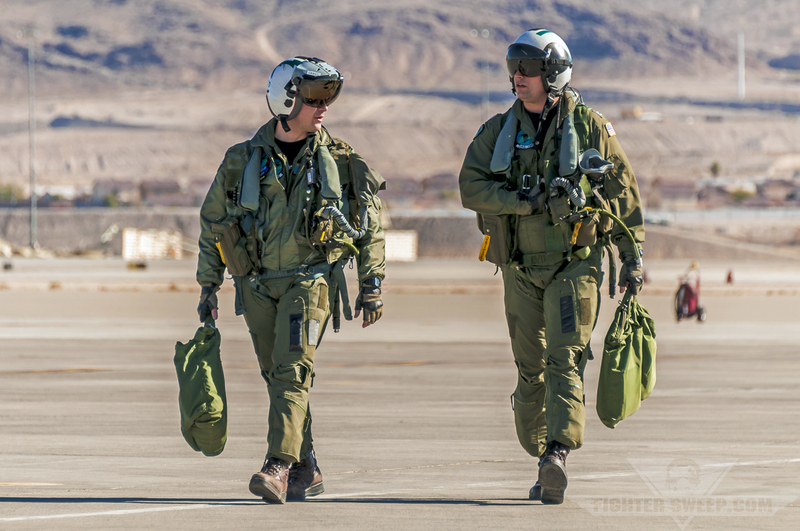 The crew of a US Navy EA-18G Growler return after a Red Flag training mission at Nellis AFB, Nevada. Note the bulky standard-issue survival vest and LPU required of Navy aircrews. I suspect a Hornet guy flying the Viper for the first time would feel almost naked, as the survival vest is omitted (except during combat or Operational Readiness Inspections) and the survival gear is located in the F-16’s seat survival kit. The F-16’s harness merely includes a small survival radio, a knife, and the LPU – and for squadrons flying over land, the LPU comes off. Of course, it’s all in what you get used to, and after a dozen or so flights, stepping into a harness doesn’t feel as awkward anymore. 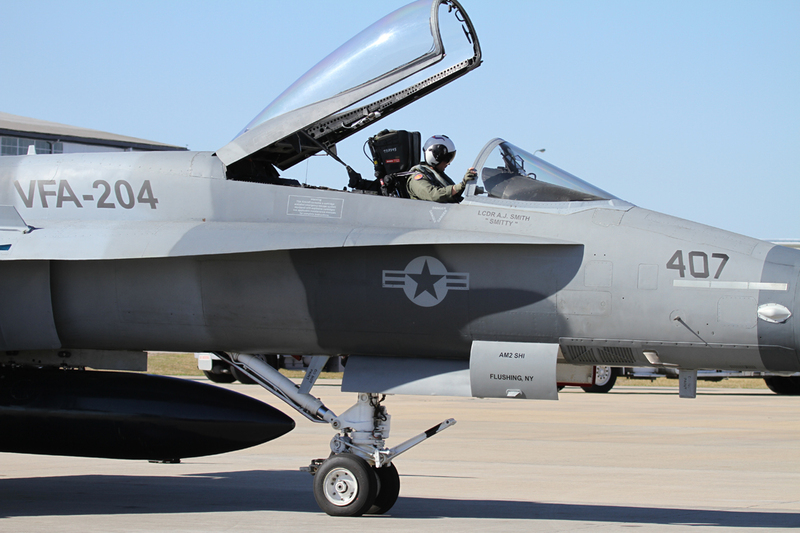 From there, Hornet guys will either wear or carry their helmets out to the jet while the Viper drivers generally stuff their helmets in their helmet bag, throw it over their shoulder and head out toward the airplane. In the Navy, the aircraft’s logbooks and forms are kept in Maintenance Control. This is the last stop a pilot makes before heading out to the flight line. Here, the pilot signs for the jet and receives a quick briefing on the status of the aircraft. The Air Force, on the other hand, keeps the forms out with the aircraft, so after shaking hands with the crew chief, the pilot will review the records and sign for it at the jet. Walking, or stepping, out to the airplane, one thing is the same – the professionalism and pride of the men and women working on the aircraft. 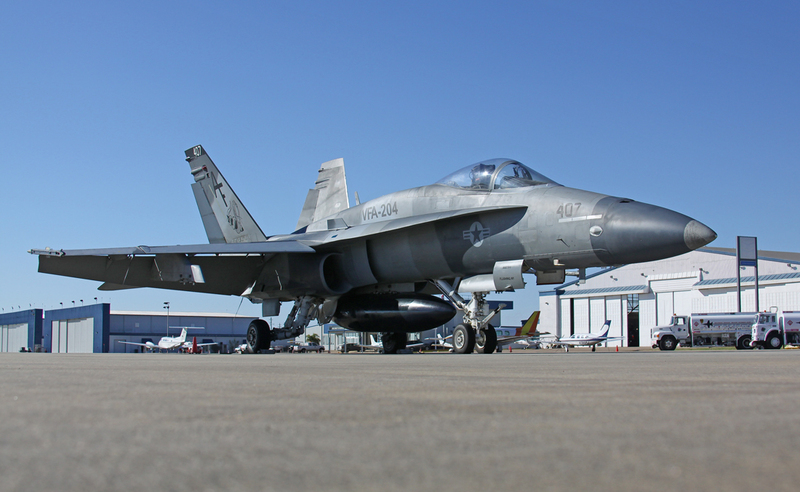 Maintainers from both services take pride in caring for the aging fleet of Hornets and Vipers. Whether it’s the Navy Plane Captain or Air Force Crew Chief, I was always greeted with a sharp salute and handshake from a man or woman proud of the work they had done to get the jet ready for the day’s mission. The author checks over the maintenance records for the 93 FS flagship prior to a training sortie at Homestead AFB, FL. Physically, the Hornet seems like a much bigger aircraft than the Viper. It has a wingspan that’s five feet wider and it seems to sit a few feet higher. The first thing you notice in doing the walk-around is how much beefier the landing gear is. It’s designed to take the impact of a pitching carrier deck at nearly one thousand feet per minute, whereas the Viper is most comfortable with a greased-in landing on an eight thousand foot runway. Even so, the gear components themselves are surprisingly fragile, and the preflight inspection of the Hornet must be very detailed regardless of the intended landing environment. The design of the main gear and how it extends can cause its own problems. The dreaded “Planing Link Failure” emergency has resulted in loss of aircraft. This Planing Mechanical Assembly includes connecting link, bell crank assembly, planing link, planing arm spring, shrink link and axle lock links, all designed to help the F/A-18’s massive landing gear rotate and fit in the gear well. Although an innovative design, this part has been prone to failure at the worst possible times, causing aircraft to veer off the runway if not countered quickly enough. In addition to being less heavy-duty, the F-16’s landing gear is relatively simple. The preflight is fairly straightforward, with special emphasis placed on the F-16’s Emergency Power Unit. Powered by hydrazine (the same fuel used to power the space shuttle booster rockets), this backup power unit can run the hydraulics and electrical power for a limited time in the event of engine loss. There’s a mustard-colored disc that turns a dark-purplish color to indicate whether the unit has been fired. The hydrazine is very toxic to humans, potentially creating a HAZMAT incident all on its own. 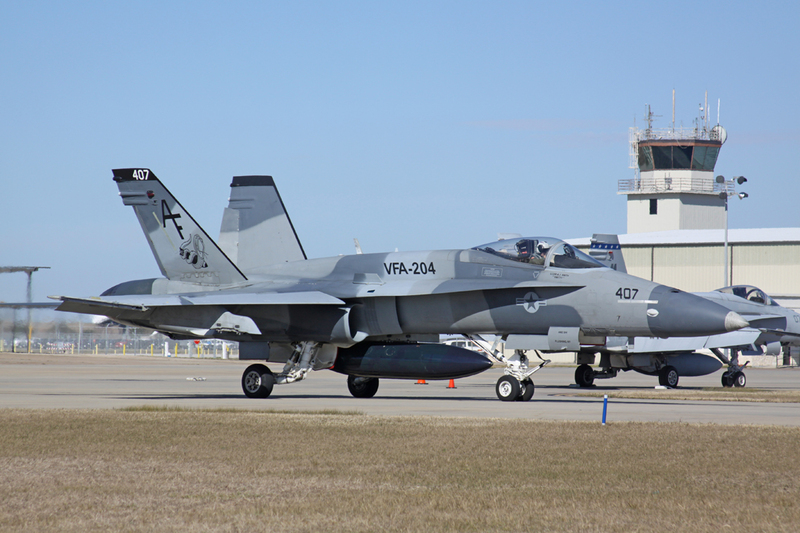 A Boeing F/A-18A+ Hornet from VFA-204 sits on the ramp. The Hornet is a noticeably larger, sturdier aircraft than the F-16. Beyond the gear, the Hornet also has obvious differences designed for the carrier environment. Its wings are hinged to allow for folding to make room on the carrier deck or hangar. It has a launch bar on the front of the dual-wheel nose gear, and a giant hook that can be raised or lowered in flight. 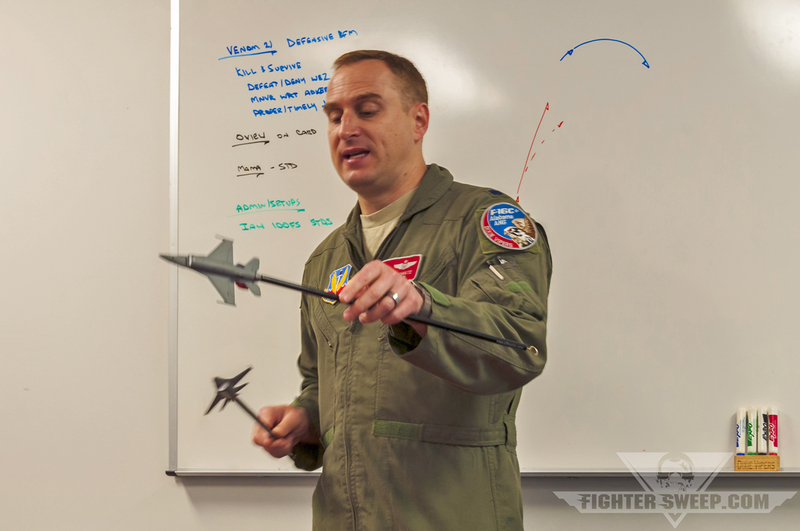 The F-16 also has a hook, but it’s for emergency use only and is not designed to be raised and lowered in flight – the hook is about 2/3 the size of the Hornet’s hook. Both aircraft have the M61 Vulcan Cannon with over five hundred rounds of 20MM. The Hornet’s gun is located in the nose, while the F-16’s gun is just over the pilot’s left shoulder. Preflight of missiles and bombs is nearly identical for each aircraft, with the Hornet being capable of a slightly heavier payload. With the pre-flight walk-around complete, it’s time to climb the ladder and strap in. The Viper doesn’t have its own ladder, so the squadron has to have its own ladders to throw over the side for the pilot to climb in. This can be kind of a pain when going to places not familiar with F-16s. The Hornet has its own ladder underneath the left Leading Edge Extension, and Super Hornets actually have a power ladder that can be activated from inside the cockpit. If you’re one of the cool kids who walked around the jet with your helmet off, in the Navy, you’ll have to throw it back on to climb the ladder. I’m sure one guy somewhere fell off and hit his head, so everyone has to wear it getting into the jet. 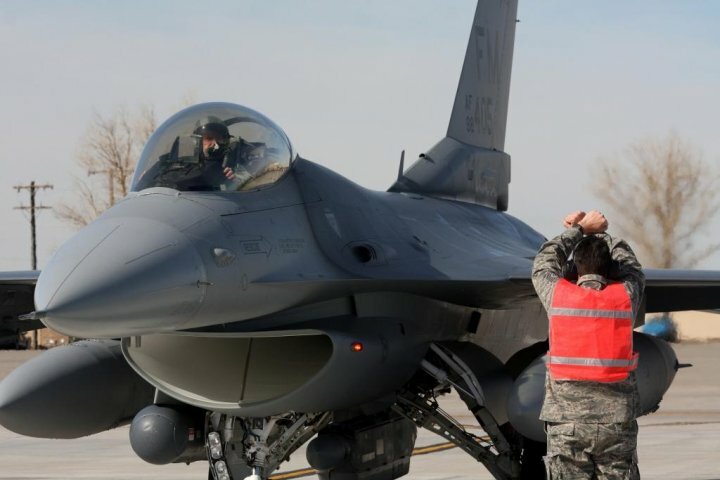 Most F-16 guys will have put the helmet on the right side canopy rail before doing the walk around, so they’ll be climbing up the ladder without it and would feel weird trying to wear it. Again, I guess it’s all in what you get used to. The helmet riding “Viper standard” as the author settles into the cockpit. But by the time you get settled into the Hornet’s cockpit, it doesn’t feel that much different. It’s not as ergonomic as the F-16, and the gear you’re already wearing makes it feel more cramped, but everything (except the rudder pedal adjustment knob) is within arm’s reach. Having come from four years in F-16s, sitting in the upright seat almost feels like you’re leaning forward, which is actually an adjustment option on the newer NACES SJU-17 seat. For cross-countries or ferrying aircraft, the F/A-18 has more room to store your bags than the F-16. Behind the seat, there’s a large open area called the “hell hole” where a bag or two can fit next to the 8MM tape recorders, and there are two panels on the side of the jet where bags can be stuffed next to wheel chocks and intake covers. Legally, the F-16 has nothing of the sort, although I have “heard of people” who have put bags in the “turtle back” area behind the canopy. Wheel chocks for cross-countries fit nicely back there as well, should your destination not be appropriately equipped to deal with your aircraft. “Mover” settled into the cockpit of his F/A-18 prior to a training mission out of Navy New Orleans. The only way to carry bags in the Viper on a trip is to have a travel pod – a converted napalm canister – installed on the centerline or wing. Don’t forget your screwdriver if you do, and be careful not to pull any Gs on the trip. I have heard of guys ripping the pod off during impromptu maneuvering and losing all of their luggage. Strapping into the F-16 is straightforward. Most crew chiefs will follow you up the ladder and connect the shoulder straps to your harness and plug in your G-suit before shaking your hand and removing the ladder. After that, there’s only the seat kit, lap belt and comm. cord. From there, she’ll plug into the jet’s intercom system and the pilot will talk through the startup sequence. In the Hornet, you’re on your own once you climb the ladder, and there’s a bit more involved in strapping in. There are two leg garters on each leg that must be connected to ensure the pilot’s legs clear the displays in the event of ejection. The comm. cord is actually integrated with the oxygen supply to the mask, which is great until the Liquid Oxygen (LOX) freezes the line and takes out your ability to communicate. Once strapped in, it’s all hand signals. Three fingers in the air to indicate APU start and away we go. Aside from the communications differences between the two aircraft, the actual startup sequences are comparable. The Hornet’s extra motor doesn’t really change much, except that it just sounds cool. A Hornet cranking its APU and bringing both motors online sounds like Airwolf without the cool ’80s theme song. It’s a beautiful sound. The author going through pre-taxi checks in the Hornet. With their engines online, it’s typically SOP to lower the canopy in both aircraft. Immediately, the nod goes to the Viper. It’s bubble canopy offers superior visibility in all directions, while the Hornet’s canopy bow, high canopy rails, and Leading Edge Extensions restrict visibility slightly. The Hornet does have the advantage of top and side view mirrors, in case you want to see your wingman without turning or to reaffirm that you truly are good enough, smart enough, and (gosh darn it) people like you before takeoff. I’ve heard it both ways. Both jets go through similar Flight Control System (FCS for the Hornet, FLCS for the Viper) initiated Built In Tests. During these tests, the flight control computers put the flight controls through their motions to ensure the jet is ready to go flying. The F/A-18A’s FCS reminds me a lot of the digital FLCS of the Block 40 with everything on screen. The F-16 Block 30 uses an analog FLCS which requires a bit more user input and interpretation. Weapons information, coordinates for steerpoints/waypoints, radio frequencies, and other mission planning data are all input via a Data Transfer Cartridge (F-16) or Data Storage Unit (F/A-18). The interfaces are fairly similar for the pilot. From there, the flight’s chaff/flares and training missiles are armed and they’ll taxi out together to takeoff with eight hundred to a thousand feet between each aircraft to prevent Foreign Object Debris from being blown into the intakes of the following aircraft. The Hornet’s Nose Wheel Steering is very capable, allowing for incredibly sharp turns using its “high gain” feature. This is mostly for the carrier deck environment where tight turns can be the difference between parking and swimming. The author waits to taxi, watching the hand signals of his dedicated crew chief. The Air Force tends to arm in a special area near the End of Runway (EOR), so the flight of four Vipers will taxi staggered at one hundred and fifty foot spacing (or on centerline with three hundred foot spacing) to the EOR, where crews will arm their chaff/flare and training missiles. At least with the “big mouth” intake and GE engine of the Block 30, the aircraft requires almost no throttle inputs to taxi. In fact, you’re mostly using the brakes to keep it from exceeding 30 kts in idle power. It doesn’t quite have the turning capability of the Hornet on deck, but it’s sufficient for getting around on a non-moving takeoff surface. With pre-flight maintenance checks complete, “Mover” taxis to the runway for departure. With everyone armed up and ready, it’s time to go flying. In Part Three, I’ll compare the two aircraft and their basic flying characteristics.